Little lavender bear is SO cute. It's my favorite color! I've seen the same decofuri at Marukai but not Daiso here. Have you seen the Hello Kitty package? I don't know why it's HK since it's only coloring, but perhaps just to sell the packaging. I like looking at recipes online but I don't know how to best store them for searching. If you figure a way, let us know! Wow, I need to find some decofuri! Thanks for showing us "how it's done!" Such a sweet looking purple bear! 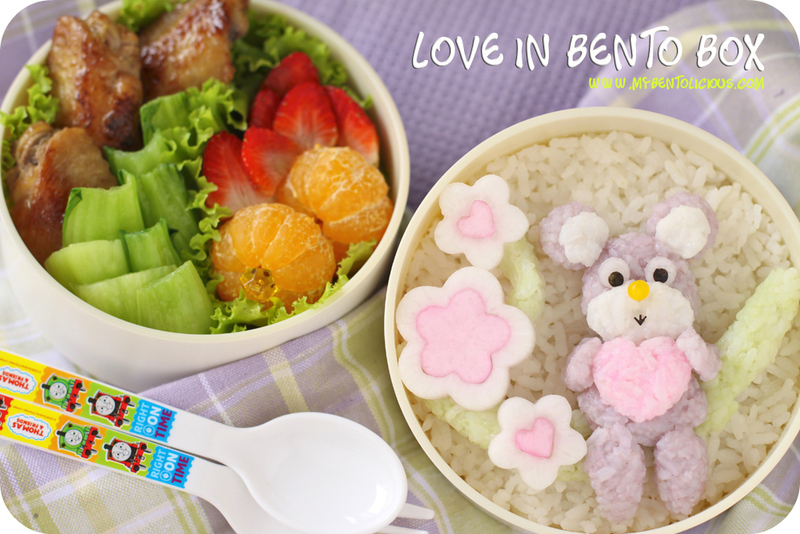 So fast you're on your Valentine bento! @Yeapies : Those 2 tones flowers were made of daikon. I cut out the center and soaked it in the water with pink food coloring :) Thanks a lot for your comment! lovely purple bear.. and i was gonna ask what did use to make the flowers.. now i know its daikon. great idea. I saw that colour furikake selling at a japan store here, but my hubby refrain me from getting it..as he cant accept colourful rice, he thinks food colouring is not healthy.. I should have just bought it anyway.. heehee..
Hi Lia, last time, I bought it from "little bento house" and I found them in facebook. I´ve been willing to try it but still couldn´t find it easily :(. About those magazines... I am just struggling with my pile of post-it-marked ones.., I have a little note in my laptop where I write the recipe tittle, tags and the magazine issue. But still feels so clumsy... Should try your scanning idea. @karaimame : Thanks a lot Lilian! I still can't find it in Indonesia. Some online stores here might carry it but I think they get it from Daiso Singapore too. I bought a lot pink T-Shirt for my daughter but I think she is sick of pink color now LOL :p She have a purple theme for her bedroom not pink. She said it clearly no pink. This little bear is sooo cute! So adorable and such pretty colors! 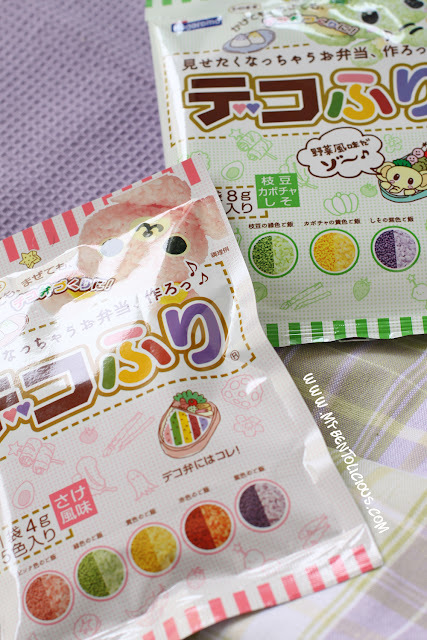 I have the same furikake and when I made the purple it turned out yucky looking. Certainly not like yours. Perhaps I made it wrong. At what point do you add yours to the rice? Awww.... Little bear is too cute!!! love it! OMG, now this my kid would go gaga over. Pink and purple bear!! I am such a newbie, have never seen or heard of decofuri-what? lol! But a new friend just pointed out where I can find furikake here in my city so I am going to check it out! Terrific Lia!! @Just a MOM : Thanks a lot Lina! Lia, he is so sweet! I just love the lavender color, does it change the flavor at all or just the color? the purple and pink hues are so sweet! What an adorable little bear!! @Bar 7 Ranch : Thanks a lot! I bought lots of deco furikake from Tokyo's 100 yen shops.. but I don't really know how to use them as I can't read Japanese.